What goes into a statement-making pout? Your lipstick of course. With Valentine’s Day coming up, we’re sure that you’re already planning for date night, and the most important part of your makeup to consider is your lipstick. You’d want something that’s bright and bold, yet won’t feel uncomfortable on your lips, and (most importantly) not stain everything your lips touch which can make eating and drinking very messy. Following on the footsteps of their cult favourite Rouge Edition Velvet range, Bourjois is releasing a lightweight, long-lasting matte lipstick in an extensive range of colours just in time for Valentine’s Day. The Rouge Velvet Lipstick comes in 12 different shades gradating from nudes to blushes, reds and even a brunette brown. If you’ve been avoiding matte lipsticks, you might want to give Bourjois’ latest range a try – these intensely matte lipsticks will sit comfortably on your lips without resulting in cracked lips for the entire day. 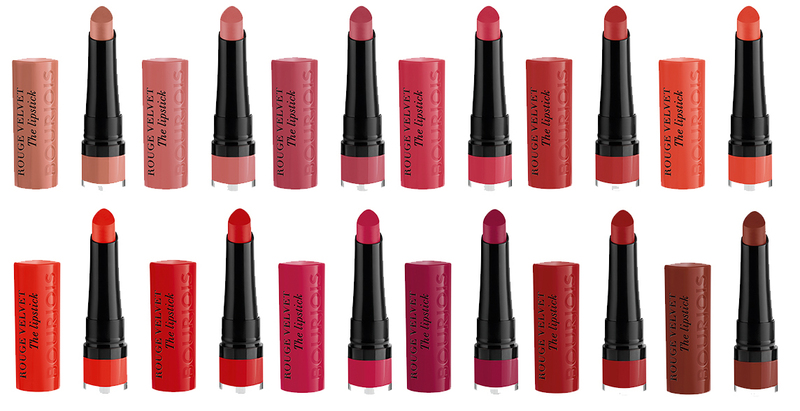 Oh, and the lipsticks are perfect for date-night – scroll to find out why! The lipstick comes in a contoured, tear-drop shape that hugs the shape of your lips to make defining them easier, and is saturated with pigments for intense colour without having to build it up. We tried out a few colours and found that the intense colour payoff for the darker colours actually delivered on their ‘one-swipe’ promise. The lighter blush and orange reds took a couple more swipes to bring out a pop of colour, but weren’t any less disappointing. Best yet, the formula provides round-the-clock hydration so that your lips feel as good as they look. We totally get the frustration with your lipstick sinking into the cracks of your lips or caking up, and you won’t have to worry about discomfort with these lippies from Bourjois. You can enjoy your day without worrying about messing up your lipsticks. As if that wasn’t enough, the formula is also transfer-proof date-proof. Go all out and have anything you desire for dinner, or even feel free to sneak in a kiss during your date because Bourjois promises that these lipsticks are kiss-proof, eat-proof and drink-proof. We can’t attest for the kiss-proof part yet, but we can definitely say that they are eat-proof and drink-proof. The lipstick managed to brave through our soupy noodles that we had for lunch with minimal transfer, and there were no patchy areas when we examined our lips in the bathroom mirror afterwards. We even dare say that the colour was almost as strong as when we first applied it. No more messy eating! Check out all 12 swatches below to see which ones will tug at your heartstrings, because these lipsticks will definitely not tug at your lips. Our favourite shade from the the entire range has to be Magni-fig, a sophisticated deep berry perfect for glamming it up for that special someone (reminder: Valentine’s Day is coming up!). If you haven’t touched matte yet, well, there’s no better time than now! The Bourjois Rouge Velvet The Lipstick, $25, is available in 12 shades from 1 February 2018 at selected Watsons outlets.